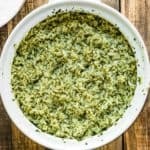 This Easy Instant Pot Mexican Green Rice is absolutely delicious! Perfect side dish for a quick weeknight meal. It requires no fuss and very little effort. WIN-WIN. Make a big batch and freeze leftovers for later. Blend in a blender water, cilantro, poblano, green onion and garlic until well blend and smooth. You can also use a food processor. Place rice in a fine mesh colander and rinse it under cold running water until the water runs clear. Turn on the Instant Pot and select "Sauté" adjust to more. Add oil. When hot add the rinsed rice. Toast rice for 2 - 3 minutes until most of the moisture is absorbed and rice starts to look a little toasted and coated with oil, stirring constantly. Add water-cilantro mixture, salt, cumin, vinegar; mix to combine. Bring to boil. Secure the lid to the Instant Pot. Close pressure release valve. Select "manual", or "pressure cook", and adjust cooking time to 8 minutes. When the time is over, let the pressure release on its own for 5 minutes. Then, carefully turn the valve to "Venting," to release any extra pressure that might still be in there. Then remove the lid. Press "cancel". Sprinkle lime juice over the cooked rice. If you are using water add 1 or 2 teaspoons of salt, depending on your taste. I usually add 1 teaspoon. If using chicken stock, you probably won’t need any more salt. However, you can taste and adjust to your liking. This Easy Instant Pot Mexican Green Rice recipe calls for water or chicken stock but you can also use vegetable stock.